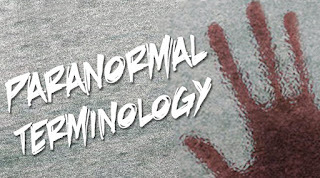 Paranormal Terminology | . ::Khawaja's Blog::. 3rd. In this world every thing is based on the good & evil so some creatures are in good category & some are in evil.Here we can just try to make to put them in logic, some are understood and some are not So here we came to try our best to put them in logic and been understood by all. (i) Those who fly in the air(hope so these are orbs which are found rarely in the photos). (ii) Those who are in the snake & dog forum or in other animals forum i-e, Demons, Gora Danch. (iii) Those who travels & stays mean the Ghosts, Bhoot, Pareat, Baad Ruh etc. Now there's come a question that how they are same? Ans: If the Human is also known an Animal just like they are known as a Jin, only the types are different.  As we a muslim and being a muslim, our GOD ALLAH & Holy Book Quran says that the" I created Jins & Humans for MY worships"(alzzaryat; 56), So we say that these all creatures are JIN, The real/basic meaning of JIN is can't seen/Hidden creature/disappearing as explain above before.  In Pakistan, India and in some other countries the people says that the ghosts bhoot jin etc is in his/her body or he got him/her, actually what happen here, first they have a power of mind reading/mind controlling, how can they controll us? Here the came the word Psycho-Kinesis the word came from Tele-Kinesis(From a Greek word meaning any motion that activated from a distance. Technically this could describe remote-controlled toy, so we use the psycho-kinesis for our research) so they can just read/controll our mind and secondly they have very high magnatic frequency(EMF), so when they show there selives or move around us we can't tolerate their frequency, we feel feer and fall ill.
One of several terms used interchangeably to refer to life after death. Other terms include "crossing over the Otherworld" and "the other side". Most ghost hunters avoid specific religious terms such as "heaven" when discussing ghosts, hauntings and an afterlife. Visitors from other planets. We differentiate aliens from visitors that might live in parallel worlds the Otherworld. Something that is out of place and unexplained. In paranormal studies, it refers to any phenomena that we cannot explain, i.e. A lens flare in a photo is not an anomaly, but an orb that we cannot explain is an anomaly. Since the early 17th century this is refer to any ghost that seems to have material substance. If appears in any physical form including a vapor-like image, it may be called an apparition. From the Irish, Bean Sid-he, meaning female spirit. Her wail does not always mean death and she does not cause anyone to die. She's generally not a ghost. Ridding an area of lingering unpleasant energy. It does not “kill" a ghost. Space clearing may encourage ghosts to cross over or at least leave the haunted location. Historically this term has included deceased individuals. However since the early 18th century it usually refers to an evil spirit sometimes more powerful then man, but less then Deity. Today we generally do not use this term to indicate a deceased human being. The female demon very rarely mentioned is a demo-ness. A concept made popular in early 19th century. A doppelganger is the apparition or double of living person usually evil. Often referred to as "ecto" this is the physical residue of psychic energy. Ectoplasm can be seen by the naked eye and is the best viewed in dark settings. since it is translucent and tends to glow. It is very unusual and usually fades from sight gradually. It is said to emanate from mediums during trance like states to take on the form of a present jin. Electro Magnetic Field or Electro Magnetic Frequency. As the name suggests, it's a combination of electrical and magnetic fields. You'll find high EMF levels around power sources like fuse boxes, electrical outlets, computer monitors and microwave ovens etc. It is said that ghost emit electro magnetic energy. Any being including people and ghosts. Most people who are familiar with this term wrongly associate an entity with the film of the same name. This is not necessarily a violent sexual predatory jin. Electronic Voice Phenomena or the recording of unexplained voices usually in the haunted settings. Usually this means beings that live in the Otherworld or Underworld parallel to our world and not far from it. Many people who readily accept the reality of ghosts don't believe in fairies. A sentient entity or spirit that visits or lingers in our worlds after he or she lived among us as a human being. There are two types of ghosts: 1. The good ghosts, which are not in our world they are in haven coz of the good work in this world. 2. The bad/evil ghosts, which are stay in this world coz of some reasons such as in the accident, in murder or punished by there bad work in their previous life. Mistakenly used to mean a ghost this word comes from the Middle East where it refers to an evil spirit that robs graves. This was also applied to body snatchers who stole corpses from fresh graves to sell as cadavers in medical research. Describes a setting where ghosts, poltergeists and/or residual energy seem to produce significant paranormal activity. The word "haunt" originally meant to frequent. A person with the ability to communicate between our world and the other side. From the Latin, meaning something that is concealed or covered. Since 16th century it has meant anything that is mysterious. Today it generally refers to magical, mystical and experimental studies. A round, whitish or pastel-colored translucent area in photos. Rarely seen in real life. Generally, these are perfectly circular, not oval. Many researchers believe that they represent jin,spirits or ghosts. From the French and German words for "yes" this is a spelling board used with a planchette. The device is intended to questions. Many ghost hunters don't include them in scientific investigations, and some people object to them on principle. The prefix, "Para" indicates something that is irregular, faulty, or operating outside the usual boundaries. So, "Paranormal" refers to anything outside the realm and experiences that we consider normal. The study of mental abilities and effects outside the usual realm of psychology. Parapsychology includes the study of ESP, ghosts, luck, psycho-kinesis, and other paranormal phenomena. A small weight at the end of a cord or chain that is usually about six to ten inches long. The movement of the weight of the weight, when uninfluenced by other factors, can be used to detect areas of paranormal energy. From the German meaning "noisy ghost". This term has been in use since the early 19th century to mean a spirit that makes noise or otherwise plays pranks..... often annoying. Unlike other ghosts, poltergeists can move from one location to another, following the person they've chosen to torment. Literally, a doorway or gate, this term suggests a specific location through which spirits enter and leave our world. When there are multiple phenomena in a confined area such as an abundance of unexplained orbs, Some people call this is a "Ghost Portal". Objects, rituals, routines, tactics or processes through which you guard yourself against psychic, demonic or paranormal intrusion and effects. Popular term used to mean any psychic phenomena, psychic abilities and sometimes inclusive of paranormal disturbance as well. From the Greek word meaning of the soul, or of life, this word usually refers to the world outside the domain of physical law. "Psychic" can relate to the jin,ghosts,spirit or the mind, depending upon the context. When someone is described as a psychic, it usually means that he or she is able to perceive things that are outside traditional physical laws and perceptions. The popular British term used as an adjective or adverb, for what Americans call "psychic." Many ghost hunters believe that emotionally charged events leave an imprint or energy residue on the physical objects nearby. What distinguishes residual energy from an active haunting is that the energy/impressions repeat consistently, as if on a loop. The energy levels may increase of decrease, but the content remains the same with each manifestation. By contrast in what we term an active haunting, the ghost may respond to environmental stimuli and direct contact. A visual effect described as the sparkle of embers falling immediately after a fireworks display. These small sparkling lights usually occur no closer to the camera then ten feet. They are often 20 to 50 feet away or more. Sparkles are seen during and especially immediately after the flash on a camera is used. Even the most vivid sparkles will not show up on film. (If they do, check for dust or insects.) Sparkles are paranormal phenomena. This word comes from the Latin, meaning that which breathes. It means that which animates life, or the soul of the being. The history of "Tarot" cards is still unclear. However since its use in 14th century Italy, "Tarot refers to playing cards that are also used for fortune-telling or divination. From a Greek word meaning any motion that activated from a distance. Technically this could describe remote-controlled toy, so we use the psycho-kinesis for our research. Since the time of Descartes, This has indicated the rotation of cosmic energy around a central point or axis. Beginning in the mid-19th century, the word "Vortex" has meant whirling movement of energy or particles. Some people use this term to explain lines or narrow cylinders that appear highlighted in ghost photos.